The weeks after Kali’s death were difficult. The first week we couldn’t stop crying, thinking and talking about her. We alternated great sorrow for Kali with great love for Darwin. He got lots of attention. Mark and I took turns comforting each other. We were confused, second guessed our decision at the vet and felt like zombies. Hundred times, we talked everything through and convinced ourselves we made the right decision. We also appreciated the time we had together with her and were happy about the fact that we knew she was precious and that we always expressed our feelings and love towards her. Life had to go on, though. 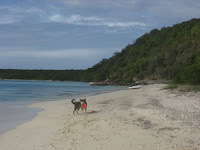 While the tears were running over our faces, we left Culebra, the last place where Kali was a happy girl. Darwin looked at us. Something was missing and would stay missing. Culebrita was our next stop. 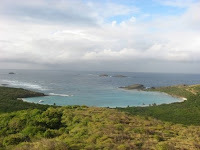 This little island east of Culebra was a place we looked forward to visiting. We tried to enter the bay on the north side. The wind was blowing hard, the waves were pretty big and to top it of, a squall just hit us when we wanted to enter. Waves were breaking ahead of us. All I could think was “Just a little bit further and we are safe inside”. We got pushed towards the bay by the monster waves. Luckily, Mark had more wits than me. This wasn’t good! He decided to turn around and we left the place as quickly as possible. 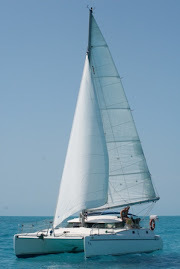 To get back out, we revved the engines and climbed a few steep waves, all the while hoping that they wouldn’t break before we got to the other side… Talking about excitement. We reached the west side of Culebrita without further problems and wisely picked up a free mooring to spend a couple of nights. We tried to stay busy that first week. We walked the trails on Culebrita, one to the dilapidated lighthouse that offered a pretty view after a dangerous climb, another to the beautiful north beach. 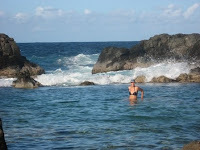 From there, we reached “the baths”, pools of water surrounded by rocks. Each time a big wave arrived, everybody got splashed, the water rose and bubbles appeared. We also found another, less crowded beach on the east side of the island. Darwin joined us every moment of the day, even though he technically wasn’t allowed on the island. We don’t really see why, since he behaves very well and we encountered several lizards, birds and a deer in his presence. Who could say that while visiting this wonderful island? The second week after Kali’s death was a period of depression. Mark and I couldn’t get rid of our foul moods and we blamed each other for everything that didn’t go right in our lives and on the boat. It was terrible. We made the “smart” decision, to leave Culebrita on New Year’s Eve, knowing that –if we stayed- we would mope all day and night and straight into the New Year. 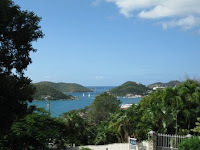 Our plan was to go to Charlotte Amalie, the capital of St. Thomas in the USVI.. We were bound to meet people there, go to parties and be surrounded by activity. And, activity there was… From the moment we arrived in the big harbour, the noise of a jet was heard overhead, a sea plane landed around the corner, the ferry wake made our boat bounce and sailboats were present as far as the eye could see. We tried to anchor in front of beautiful Honeymoon Beach, but that was impossible. The harbour was filled with moorings and boats; the water was deep and the holding terrible. We decided to anchor somewhere else and were glad we did. What a contrast with the Spanish Virgin Islands! watched the spectacle, while Darwin was trembling against us. Kali sure would not have enjoyed this evening! planned, giving us enough time to explore town, fill our tanks and fridge and do laundry. We also needed an extra signature on Darwin’s health certificate for which we had to get to the other side of the island. The only transportation was a taxi and knowing the expense for that, we decided to hitch a ride. When our vet heard about our plan, he promptly handed his keys to us and we were able to use his car to deal with the red tape. There are friendly people in St. Thomas; you just have to find them! Darwin’s tumor was benign and we took the stitches out a week later. 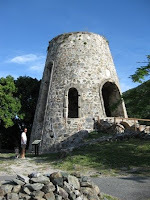 Irie and crew explored St. John in the meantime. The harbours were busy and anchoring was getting challenging, but we managed. 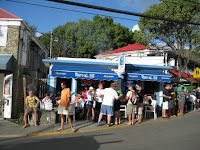 Cruz Bay is a funky little town with cheap happy hour at Woody’s. Most of the island is National Park, where overnight stays cost $15. We decided to “splurge” one night and picked Waterlemon Bay as our destination. After picking up a mooring ball, snorkelling around the reef and enjoying the pretty surroundings, we took Darwin to shore. The three of us walked to an old sugar mill and to the top of a hill, where the view was amazing. 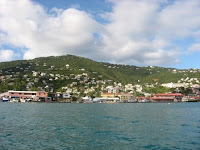 We could see Tortola and the British Virgin Islands. So close, but yet so far away. 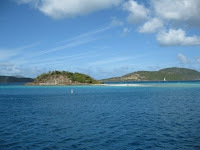 Before leaving the US Virgin Islands, we had to sail to the other side f St. John and check out Coral Harbour. The sail to the east side of the island was exhilarating. Beating into the wind was hard work, but we were flying and thoroughly enjoying it. Coral Bay didn’t do much for us (yet), but we wanted to see what it was like. 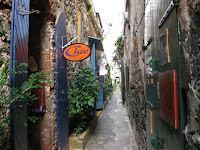 The people are way more friendly and relaxed here than in St. Thomas, which we really liked. Somewhere in our head we have the feeling that we might come back to this place for a longer period of time. However, the options for anchoring around the island are not optimal. After a few more days of keeping Darwin out of the water, he was ready to swim again and get rid of his piled up energy. That didn’t happen until we reached the nice beaches of Tortola in the British Virgin Islands, a place that Kali would have loved.